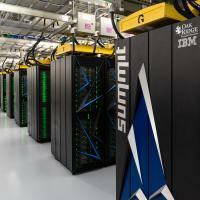 The world’s fastest, most powerful supercomputer, named Summit, is ready to work. Acceptance testing is complete, and selected Summit Early Science Program users are starting to tackle the most complex of science problems on the 200-petaflop IBM AC922 Summit supercomputer. Located at the U.S. Department of Energy’s Oak Ridge Leadership Computing Facility at the Oak Ridge National Laboratory campus in Tennessee, the Summit system enables scientists to explore new territory and uncover insights by applying artificial intelligence algorithms. What are scientists studying? To advance human exploration of the Red Planet, a NASA team will simulate flow between the Martian atmosphere and descending rocket exhaust. Another team affiliated with the Oak Ridge National Laboratory will access Summit’s high performance computing to better understand the underlying genetic architecture of how individuals develop chronic pain and respond to opioids in order to combat opioid addiction. In the field of cancer research, the Centre for Computational Science at University College London has been awarded an allocation of Summit supercomputer resources (25,000 node hours) through July 2019 to extend the INSPIRE DOE INCITE project. The goal is to help determine drugs to administer to cancer patients whose target proteins have developed resistance to the first level drugs they have been treated with. Scientists from around the world have access to Summit through the 2019 DOE INCITE program. Overall, there are currently 30 projects in categories that cover astrophysics, bioinformatics, biophysics, chemistry, combustion, earth science, engineering, fluid dynamics, fusion energy, high energy physics, machine learning, materials science, nuclear physics, and turbulence. For other opportunities, researchers have a February 13, 2019 deadline to submit proposals to access Summit for the 2019–2020 Advanced Scientific Computing Research Leadership Computing Challenge program. More information is available on the U.S. Department of Energy website.